A study recently published in Nature suggests that an extreme global warming event 56 million years ago known as the Palaeocene-Eocene Thermal Maximum (PETM) was driven by massive CO2 emissions from volcanoes during the formation of the North Atlantic Ocean. Using a combination of new geochemical measurements and novel global climate modelling, the study revealed that atmospheric CO2 more than doubled in less than 25,000 years during the PETM. The PETM lasted ~150,000 years and is the most rapid and extreme natural global warming event of the last 66 million years. During the PETM, global temperatures increased by at least 5°C, comparable to temperatures projected in the next century and beyond. While it has long been suggested that the PETM event was caused by the injection of carbon into the ocean and atmosphere, the source and total amount of carbon, as well as the underlying mechanism have thus far remained elusive. The PETM roughly coincided with the formation of massive flood basalts resulting from of a series of eruptions that occurred as Greenland and North America started separating from Europe, thereby creating the North Atlantic Ocean. What was missing is evidence linking the volcanic activity to the carbon release and warming that marks the PETM. To identify the source of carbon, the authors measured changes in the balance of isotopes of the element boron in ancient sediment-bound marine fossils called foraminifera to generate a new record of ocean pH throughout the PETM. Ocean pH tells us about the amount of carbon absorbed by ancient seawater, but we can get even more information by also considering changes in the isotopes of carbon, which provide information about the carbon source. 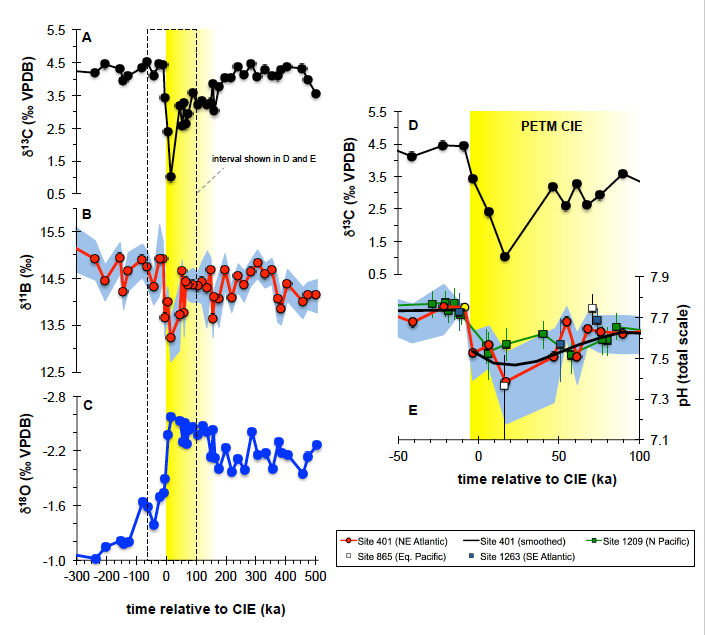 When forced with these ocean pH and carbon isotope data, a numerical global climate model implicates large-scale volcanism associated with the opening of the North Atlantic as the primary driver of the PETM. North Atlantic microfossil-derived isotope records from extinct planktonic foraminiferal species M. subbotinae relative to the onset of the PETM carbon isotope excursion (CIE). 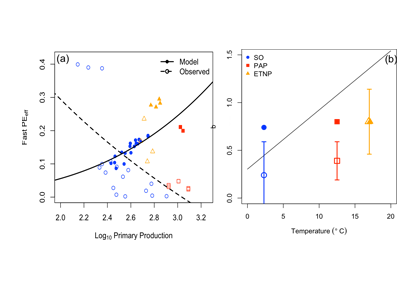 The negative trend in carbon isotope composition (A) during the carbon emission phase is accompanied by decreasing pH (decreasing δ11B, panel B) and increasing temperature (decreasing δ18O, panel C). 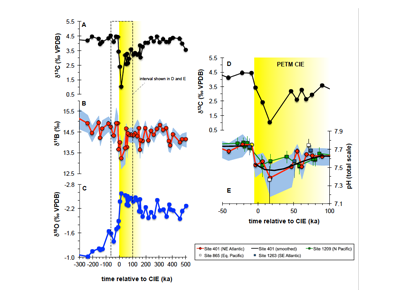 Panels D and E zoom in on the PETM CIE, showing microfossil δ13C (D) and δ11B-based pH (E) reconstructions. Also included in E are data from Penman et al. (2014) on their original age model, with recalculated (lab-based) pH values. These new results suggest that the PETM was associated with a total input of >12,000 petagrams of carbon from a predominantly volcanic source. This is a vast amount of carbon—30 times larger than all of the fossil fuels burned to date and equivalent to all current conventional and unconventional fossil fuel reserves. In the following Earth System Model simulations, it resulted in the concentration of atmospheric CO2 increasing from ~850 parts per million to >2000 ppm. The Earth’s mantle contains more than enough carbon to explain this dramatic rise, and it would have been released as magma poured from volcanic rifts at the Earth’s surface. How the ancient Earth system responded to this carbon injection at the PETM can tell us a great deal about how it might respond in the future to man-made climate change. Earth’s warming at the PETM was about what we would expect given the CO2 emitted and what we know about the sensitivity of the climate system based on Intergovernmental Panel on Climate Change (IPCC) reports. However, the rate of carbon addition during the PETM was about twenty times slower than today’s human-made carbon emissions. In the model outputs, carbon cycle feedbacks such as methane release from gas hydrates—once the favoured explanation of the PETM—did not play a major role in driving the event. 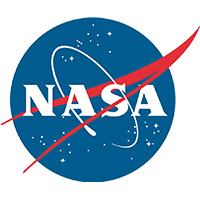 Additionally, one unexpected result was that enhanced organic matter burial was important in ultimately drawing down the released carbon out of the atmosphere and ocean and thereby accelerating the recovery of the Earth system. In the subtropical North Atlantic, dissolved inorganic phosphorus (DIP) concentrations are depleted and might co-limit N2 fixation and microbial productivity. There are relatively large pools of dissolved organic phosphorus (DOP), but microbes need an enzyme to access this P source. One such alkaline phosphatase (APase) enzyme requires zinc (Zn) as its activating cofactor. This has been known for almost 30 years. However, recent crystallography studies revealed that two other widespread APase enzymes contain Fe. Via this requirement, Fe availability could regulate microbial access to the DOP pool. As detailed in a recent publication in Nature Communications (Browning et al. 2017), this hypothesis was tested on a cruise across the tropical North Atlantic by adding Fe and Zn to incubated seawater and monitoring changes in bulk APase using a simple fluorescence assay. Adding Fe significantly increased APase activity in seawater samples collected in areas that were far-removed from coastal and aerosol Fe sources. Despite seawater Zn concentrations being much lower than Fe, it appeared not to be limiting. Iron (Fe) and zinc (Zn) enrichment experiments conducted in the DIP-depleted tropical North Atlantic suggested that Fe, not Zn, could limit alkaline phosphatase activity (APA). DIP*=DIP–DIN/16, and represents excess DIP availability assuming a 16-fold higher microbial N requirement. 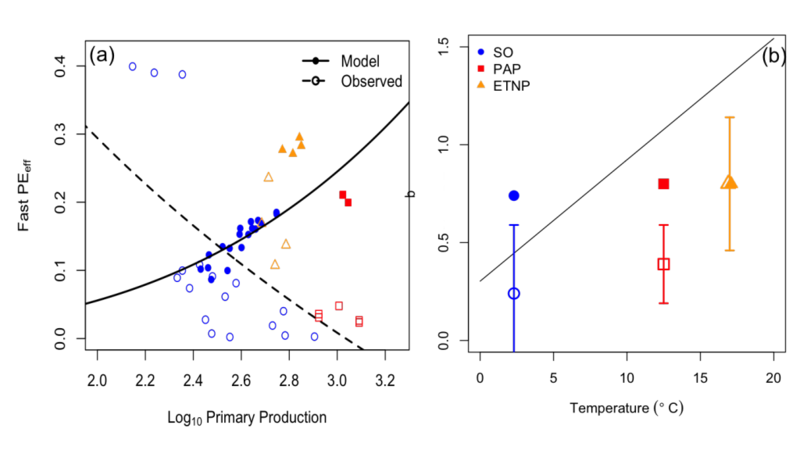 Results in the bar chart represent a subset of treatments from one experiment (out of eight conducted). 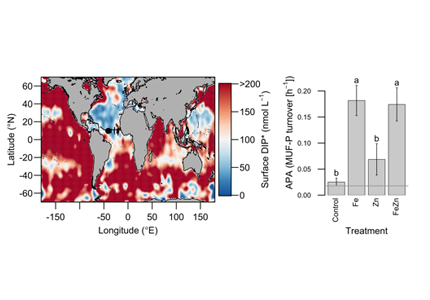 DIP is depleted in surface waters of the tropical North Atlantic because inputs of North African aerosol Fe stimulates N2 fixation and leads to microbial drawdown of DIP. If the modern ocean is a good analog for the past, the lack of APase stimulation following experimental Zn addition could reflect limited evolutionary selection for Zn-containing APase. In general, DIP is only substantially depleted where there is enhanced Fe input fueling N2 fixation; it therefore follows that any significant requirement for APases might be restricted to these relatively high-Fe, low-Zn waters. On a shorter timescale, growing anthropogenic nitrogen input to the ocean relative to phosphorus could result in more prevalent oceanic phosphorus deficiency. Corresponding iron inputs might then serve as an important control on phosphorus availability for microbes in these regions. 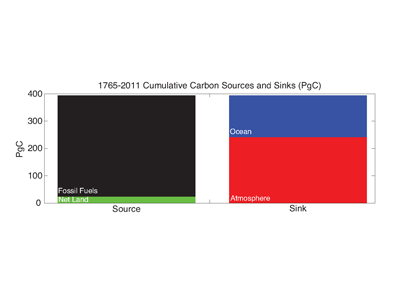 Since preindustrial times, the ocean has removed from the atmosphere 41% of the carbon emitted by human industrial activities (Figure 1). The globally integrated rate of ocean carbon uptake is increasing in response to rising atmospheric CO2 levels and is expected to continue this trend for the foreseeable future. However, the inherent uncertainties in ocean surface and interior data associated with ocean carbon uptake processes make it difficult to predict future changes in the ocean carbon sink. In a recent paper, McKinley et al. (2017), review the mechanisms of ocean carbon uptake and its spatiotemporal variability in recent decades. 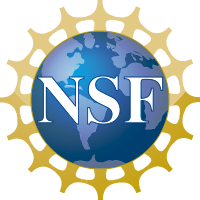 Looking forward, the potential for direct detection of change in the ocean carbon sink, as distinct from interannual variability, is assessed using a climate model large ensemble, a novel approach to studying climate processes with an earth systems model, the “large ensemble.” In a large ensemble, many runs of the same model are done so as to directly distinguish natural variability from long-term trends. This analysis illustrates that variability in CO2 flux is large enough to prevent detection of anthropogenic trends in ocean carbon uptake on at least decadal to multi-decadal timescales, depending on location. Earliest detection of trends is most attainable in regions where trends are expected to be largest, such as the Southern Ocean and parts of the North Atlantic and North Pacific. Detection will require sustained observations over many decades, underscoring the importance of traditional ship-based approaches and integration of new autonomous observing platforms as part of a global ocean carbon observing system.